The V4 engine configuration is a special one for Honda, going back nearly 40 years. A complex, yet compact unit, it has a unique power delivery and a soul all its own. Honda's current RC213V MotoGP machine uses a V4, as does the flaghip sport-touring VFR1200F. It's a powerplant woven tightly into Honda's engineering DNA. 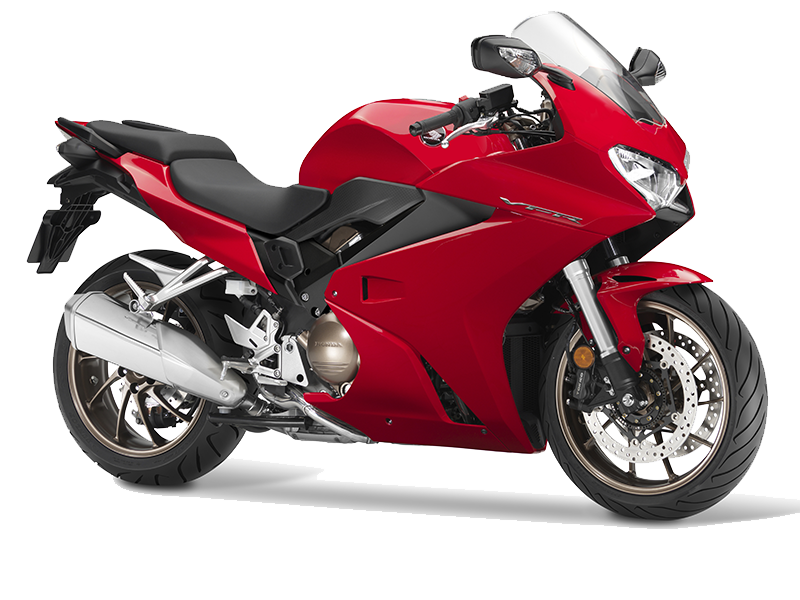 And nowhere has the V4 engine been more at home than in the legendary VFR800F series - a truly all-round motorcycle that's always done sport as well as it tours, and all areas in between, with or without a pillion. It has inspired huge loyalty among owners over the last two decades and it's estimated there are still 75,000 VFRs in regular use across Europe. The legion of VFR800F fans know exactly what they like about their bike and also what they'd like more - and less - of in a new model. With such an important model Honda has listened intently to customers views; in essence they want a high-quality motorcycle with strong low and mid-range torque, light and slim but just as capable and adaptable, with a return to the evocative look and feel of VFRs of the past. 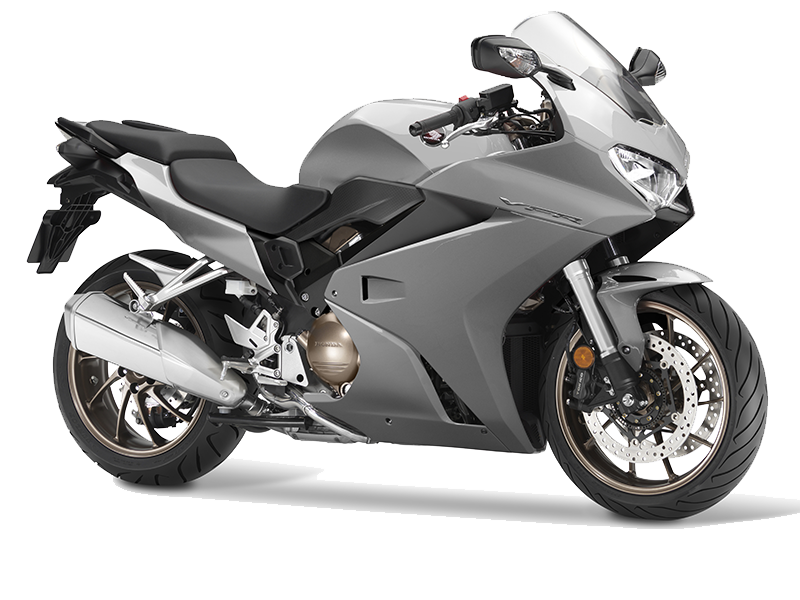 The waiting is over - the new VFR800F is here. Information on the accessories available for this bike please see the accessories page. Type Front: 43mm HMAS cartridge-type telescopic fork with stepless preload and ten DF adjustment, 108mm axle travel. VPL Terms and Conditions: New retail VFR800F ABS 14YM orders from 01 April 2018 to 30 June 2018 and registered by 30 June 2018. Subject to model and colour availability. Representative Example based on 3 years 6.9% VPL; Offers applicable at participating dealers and are at the promoter's absolute discretion. Indemnities may be required in certain circumstances. Finance is only available to persons aged 18 or over, subject to status. All figures are correct at time of publication but may be subject to change. Honda Franchise Dealers are credit brokers, not lenders. Credit provided by Honda Finance Europe Plc. Cain Road, Bracknell, Berkshire RG12 1HL. Honda Financial Services is a trading name of Honda Finance Europe Plc. a company registered at Companies House No 03289418. Honda Finance Europe Plc. is authorised and regulated by the Financial Conduct Authority, Financial Services Register number 312541. PCP Terms and Conditions: New retail VFR800F ABS 17YM orders from 01 April 2019 to 31 July 2019 and registered by 31 July 2019. Subject to model and colour availability. Offers applicable at participating dealers and are at the promoter's absolute discretion (excluding Channel Islands). Representative example based on years 6.9%% PCP. Excess mileage rate applies. You do not have to pay the Final Payment if you return the bike at the end of the agreement and you have paid all other amounts due, the bike is in good condition and has been serviced in accordance with the Honda service book and the maximum annual mileage of 4,000 has not been exceeded. Excess mileage rate applies should this be exceeded. Indemnities may be required in certain circumstances. Finance is only available to persons aged 18 or over, subject to status. All figures are correct at time of publication but may be subject to change. Honda Franchise Dealers are credit brokers, not lenders. Credit provided by Honda Finance Europe Plc. Cain Road, Bracknell, Berkshire RG12 1HL. Honda Financial Services is a trading name of Honda Finance Europe Plc. a company registered at Companies House No 03289418. Honda Finance Europe plc is authorised and regulated by the Financial Conduct Authority, Financial Services Register number 312541.